Trunks: To 12 inches or more in diameter; crown open, spreading, sometimes conical; branches drooping; bark hard, dark-grey, deeply furrowed, ridges irregular squarish blocks. Twigs: Slender, flexible, somewhat zigzag, reddish-brown; leaf scars variable, half-round on horizontal branches, others roundish; bundle scar 1, c-shaped; buds solitary, sessile, triangular. Leaves: Alternate, simple, deciduous, egg-shaped to oblong, 2-6 inches long, 1-3.2 inches wide, thin; upper surface dark green; lower surface paler; sparsely pubescent when young, glabrous when mature; margin entire, minutely fringed; base narrowed, rounded to nearly heart-shaped; tip abrubtly-pointed to tapering-pointed; stalk thick, 1/4 to 2/5 inch long, glabrous or pubescent. 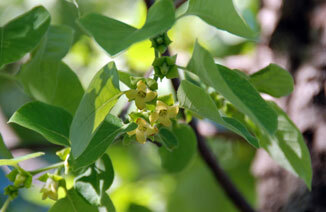 Flowers: May, with or after leaves, male and female flowers on separate trees; staminate flowers solitary or in clusters of 2-3, about 1/5 inch long, in axils of new growth leaves; pistillate flowers solitary, 2/5 to 3/5 inch long, larger than staminate; calyx deeply 4-lobed; sepals broad triangular; corolla urn-shaped, 4-lobed, pale yellow, center a brownish disc; lobes spread or curl outward; stamens usually 16, in 2 rows; anthers long, yellow; styles 4; stigmas brown. Fruit: September-October; mostly spherical, 1.2 to 2.4 inches long, wrinkled when ripe, yellowish-brown to orange or reddish; seeds few to several, oval, flat, about 3/5 inch long, reddish-brown; stalks short, stout; sepals persistent, enlarged, thick, leathery. Habitat: Dry, open woods, old fields, open, rocky hillsides. Distribution: East half of Kansas, more frequently in southeast quarter. Uses: The fruits may be eaten raw or preserved with sugar and are used in cakes and puddings. The fruits are eaten by raccoons, skunks, foxes, and opossums. The Cherokee chewed the bark to relieve heartburn. An infusion of inner bark was used as a wash for thrush. The fruits were used to make a beer-like beverage. Comments: The common name "persimmon" is of Algonquian origin. Diospyros is Greek for "fruit of Zeus". Persimmon sometimes forms thickets. Two trees are needed to produce fruit. The wood is hard, heavy, fine-grained, dark brown. It has been used for golf club heads and weaving shuttles. The flavor of the fruits is similar to dates. When immature, the fruits are bitter. The become edible after low temperatures or frost.